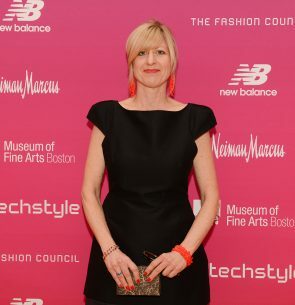 Lauren Whitley is senior curator in the David and Roberta Logie Department of Textile and Fashion Arts at the Museum of Fine Arts, Boston, where she helps oversee a collection of 45,000 textiles and costumes. Since joining the staff of the MFA in 1992, she has curated a number of exhibitions including Hippie Chic,Icons of Style: Fashion Makers, Models, and Images, Threads on the Edge: Fiber Art from the Daphne Farago Collection, The Quilts of Gee’s Bend, and High Style and Hoop Skirts: 1850s Fashion. She is co-curator of #techstylethe hi-tech fashion exhibition currently on view in the Foster gallery of the MFA. Ms. Whitley holds a M.A. degree in Fashion and Textile Studies: History, Theory, Museum Practice from the Fashion Institute of Technology, State University of New York, and received her B.A. in Art History from Trinity College in Hartford, Connecticut. Her recent publications include Hippie Chic and essays in Icons of Style: Fashion Makers, Models, and Images, The Dublin Seminar Proceedings, Massachusetts Quilts: Our Common Wealth (2009), Gee’s Bend: the Architecture of the Quilt (2006), MFA Highlights: Textile and Fashion Arts (2006), and Fashion Show: Paris Style (2006).